This site has been designed to provide information about the services provided by the client. 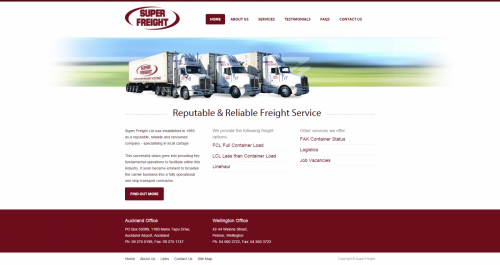 Super Freight is a reputable, reliable company specialising in local cartage. The many services they offer have made their business into a fully operational one stop transport contractor, which include FCL, LCL and Linehaul freight options. "I'm now actually enjoying having a website"